It’s a cold night in the middle of winter, and we just don’t feel like washing, chopping and dropping things into the wok. Instead, we inspect the fridge and freezer. The question, “Should we have Chinese hot pot tonight! ?” is always accompanied with a wide grin because this meal is not only fun but also easy to boot. Ahhh hot pot. Nothing says wintertime better than a nice, warm, and satisfying hot pot meal. We dust off our old Chinese hot pot and burner, fill it with some chicken soup, throw in a handful of goji berries, ginger, and sliced scallions (and maybe a packet of numbing-spicy hot pot broth base), surround ourselves with plates and plates full of raw meat, veggies, noodles, tofu, and fish balls, and settle in for a nice and long feast. Everyone picks and chooses what they want, drops food into the pot of bubbling broth, and eats and cooks as they go until stuffed to the gills and near impervious to the winter cold. If that sounds right down your alley (how could it not be?!) then keep reading for our handy dandy how-to. The basic things you’ll need are a pot and a heat source. The heat source could be an electric burner or a portable table-top gas burner. For the Chinese hot pot, you could use any wide, relatively shallow pot you have lying around your kitchen that heats easily, or go for an actual stainless steel hot pot. These days, some pots have two sides with a partition in the middle so you can have plain broth and spicy broth at the same time. Alternatively, you could also buy a hot pot with a built-in electrical heating element; the pot is removable for easy cleaning. For the dipping and cooking part of the story, you could invest in metal hot pot baskets. Each person gets one, nestles a few bites of food inside, and places it in the hot pot. Once the food is cooked, just lift your basket out, and tip the food out tidily into your bowl. You could start with simple water. By the end of the meal, it will have turned into a tasty broth! Chicken broth with a few aromatics thrown in is also a good option for your Chinese hot pot soup base. We like to add goji berries (mostly for health reasons, they don’t taste like much), ginger, and maybe a few scallion pieces. This gives your food more flavor than plain water. Spicy, numbing Chinese Hot Pot broth is the rage these days. This option has become quite trendy in recent years. As my grandma says, “All the young people like the spicy.” Even though the broth is spicy as heck, the addictive nature of the peppers kicks in, and after a while you just can’t stop eating! Proceed at your own risk. At the end of the meal, your entire mouth will be tingling with spicy deliciousness. Vegetables: Prepare any leafy green vegetables you like! In the past we’ve had spinach, choy sum, napa cabbage, broccoli, lotus root, carrots, and sweet potato. Anything goes! Meat: Chinese grocery stores sell thinly sliced meat that is specifically intended for hot pot. Buy a pack or two of beef or lamb (for the authentic Beijing experience). It makes the whole process that much easier! Always make sure that your broth is still boiling, and don’t add too many ingredients to the pot at once. This could lower your broth temperature and result in undercooked food. Seafood: Shrimp is great for this because it holds up well during the cooking process, but you could try anything you want or have on hand…squid or fish can work too. Just be sure to handle pieces of fish delicately! Fish balls: No, they are not the…uh…nether regions of a fish, but rather yummy fish meat that has been pounded and mixed with corn starch and other ingredients into a ball shape. They’re tasty as heck and are wonderful with hot pot. If you want, you can also splurge for the beef or pork filled ones! Not exactly kosher, but yummy! Noodles: Any kind of noodles are delicious in hot pot, but fresh white noodles or dried vermicelli noodles usually work best. The vermicelli noodles have to be rinsed off beforehand. Then they’re soft enough to be handled. This is where the metal baskets come in handy. You just twirl a couple of mouthfuls worth of noodles into your basket, let it bubble away in the pot, lift it out when they’re cooked, and tip the whole shebang into your bowl of sauce. Heavenly. Rice cakes are also delicious! Tofu: you’ll want to use a regular or extra firm tofu for this, so it won’t fall apart in the hot pot. You could also use fried tofu puffs (a family favorite) or fresh tofu sheets. Hot pot dipping sauce is a very personal thing–everyone makes their own. When mixing sauces, we set out tahini or sesame paste, soy sauce, vinegar, white pepper, chili-garlic hot sauce, black-bean chili hot sauce, cilantro, scallion, garlic, sesame oil, and a store-bought “hot pot sauce.” The traditional way is to start out with a base of tahini and add flavorings from there. The “hot pot sauce” is super tasty and is an inexpensive way to make a delicious sauce that tastes just like the restaurant. There are a lot of brands out there, but we’re not picky. You can go by my metric and just pick the one with the prettiest label. Whenever we have hot pot, some of us always like to have a bowl of rice on the side. After all, how can you eat all these yummy things doused in sauce without some white rice to balance things out and satisfy your inner carbohydrate monster? Eating rice with hotpot isn’t the norm, however. Because noodles and rice cakes are often served, most people don’t see a need for rice. Plus, why fill up on rice? So, if you’d rather save room for a few extra slices of beef, skip the rice. But, if you’re like some us (i.e. just Kaitlin) and relish the idea of having a nice bed of white rice to go with all that dipping sauce, then more power to ya! In Beijing, hot pot is a wintertime staple. In true Chinese fashion, a lot of tasty, cheap, and casual hot pot restaurants have sprung up. The best part about these places is that everyone gets their own individual little pot with the choice of broth, dipping sauce, and food stuffs. The biggest chain is probably Xiabu Xiabu, where you can order the food and the sauce ingredients that you want. Our favorite place, however, is tucked away in the Solana Mall in Beijing but has been closed down last we visited. They followed the standard format of having your own individual pot, but the raw food circulates around the room on a conveyer belt, sushi bar style, and you just pick and choose what you want as it passes. After they closed down, we discovered Haidilao Hot pot restaurant (海底捞火锅) which is one of the best hot pot restaurants out there with superior service and food. 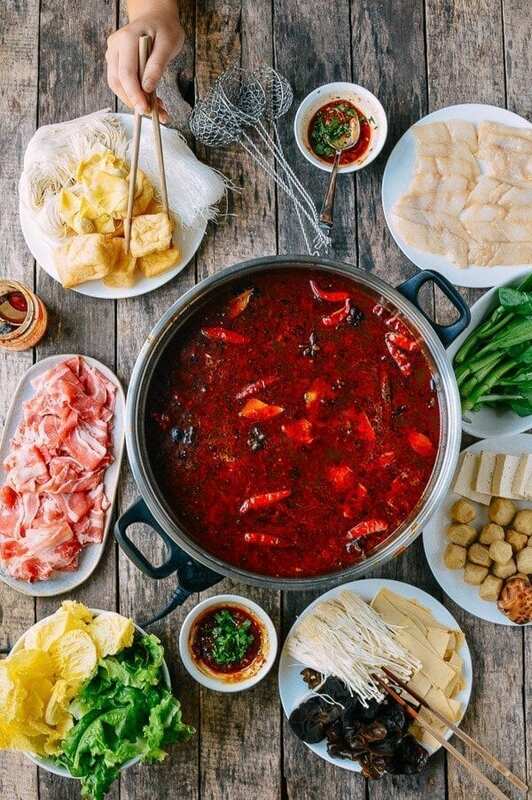 The restaurant chain originated in Sichuan province and the name is super cool – it translates to sea bottom fishing, which is what you do when you’re having hot pot! They are a bit pricey by China standards but still very cheap for foreigners and totally worth it! It’s a lot more fun, and you have access to a big variety of veggies and noodles. For meat, you order from a menu and pay a little extra. There’s also a SAUCE BAR with big bowls full of tahini, soy sauce, vinegar, sesame seeds, chopped garlic, sliced scallion, hot oil, fresh cilantro, salt, white pepper, sesame oil, and a bunch of other yummy pastes that we don’t know by name. It’s lovely. If you’ve never had the hot pot experience, it’s well worth a try. It’s not exactly common in the U.S., but if you’re around any Chinatown, you may be able to locate a restaurant that does it well. If not, try out your own hot pot set-up at home. Your hole in the wall favorite place is no longer there. Next time leave the name so other people can easily find it. Or find it’s gone, like in this case. Thanks Jelly Fish, we finally did update this page. Thanks for your feedback! can you make the hot pot broth the day before? Hi Terry, yes, you can. Just reheat the next day before serving. Thanks for your guidance. I just purchased a hot pot and many of the goodies that go along with it. Cant wait to have friends and family just sit around the table and enjoy yummy food and good company. Do you have a good recipe for a Sichuan spicy broth? Hi Kathleen, we have a Sichuan Hot Pot recipe. Check it out! Do you drink the broth or what do you do with the broth once it is over? Hi Leslie, we do drink the non-spicy broth from the hotpot and it is like a great soup from dipping all of the meat and veggies. I would not recommend drinking the spicy hot pot broth! I bought one of those non-electric hotpots in Thailand (it takes charcoal or that stuff that burns under a bain marie)… Is it that same concept? I’ve never known what to do with it… I suppose it could be just for serving a nice tom yum too? Sounds like you could use it for hot pot, as long as it gets hot enough to keep the liquid at a simmer and you can use it safely! so excited to see your recipes…I’ve had a great wok for over 40 years..just not great recipes. also just bought a hot pot at the Asian market…wasn’t sure how to cook in it. Thank you…I am definitely a follower…. This is so great! Thank you for explaining! I had a wonderful hot pot meal with my Chinese friends in college for the New Year celebration a few years ago and have been thinking about it every since. I think the best part is the wonderful conversation that takes place around the pot. Thank you again for sharing this and your traditions with the world! Hi Samantha, you’re welcome! The best part really is that it’s a slow meal that you can linger over. Glad you enjoyed your experience and the post! Cheers!